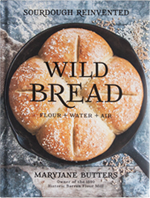 I received my Wild Bread book yesterday and this morning I ordered four items from Amazon. The Glasslock 3.75 mix-bowl will not be delivered until 4/6 - 4/13. The Pyrex 8 cup measuring cup, digital thermometer, and 1/8 cup coffee scoop in two days. Will make due with glass bowl on hand until I receive the correct size bowl. All other supplies that are not now in my kitchen will have to wait until I build up my stash of shopping money. I signed up for Prime so enjoyed free shipping. The free shipping paid for the digital thermometer. Amazon did not offer the ThermoPop but I'm satisfied with the one I ordered. The large LCD display is a plus for me. Once Ashley gets in I'll ask her where else you can buy the Glasslock and have it arrive earlier. Easy enough to make-do as long as the base fits into the baking dish for water uptake. I forgot to say the 1/8 measuring cups are in a set of 3 so I can filled them with flour and line them up in a row so I make sure I have 3/8 cup. I never enjoyed baking because of all the precise measuring - I'm more of a handful of this and a pinch of that kind of FarmGirl so anything I can do to make measuring easier for me is a good thing. Hi Sara, It sounds like you have a great start on your equipment. The late arrival of the Glasslock bowl is a bummer. I went to Amazon to check out if there was another seller that might ship faster, but had no luck. I also checked out http://glasslockusa.com/ They have the bowls in stock, but with shipping, the bowls are about $12 more, and it looks like you don't get a delivery estimate until checkout. On a fun, positive note, when I was looking at the Glasslock bowl on amazon, under their "Frequently bought together" heading, they list the Glasslock bowl, Marinex baking dish, and 1.5-qt Pyrex loaf pan with lid. This sure seems like Wild Bread has been influencing some product sales, which tickled us pink here at the farm. :) Maybe that's part of the reason your Glasslock bowl is going to arrive later than everything else? 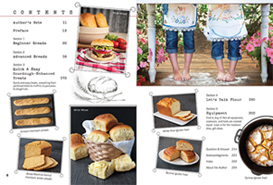 I'll add the 1.5 qt Pyrex loaf pan to my growing list. Rec'd 8 cup Pyrex measuring cup, 1/8 cup coffee scoop, and meat thermometer today. So much fun to get things in the mail. Reminds me of ordering things from Sears catalog when I was a kid in the 1940s. 3 1/2 qt mixing bowl is in Texas about 100 miles from me but sometimes that last 100 miles can take two days but again I may get it tomorrow. Tomorrow would be good then I could start my Mother on Sat. I have chosen Sat as my day to bake. Unbleached flour was on sale today so I got 20 lbs when I grocery shopped. Two 5 lb bags for $4. After I know what I am doing when it comes to caring for Mothers and baking bread I hope to be able to buy better flour. Just a thought on what I spent on what I needed to get started on my adventure of making Wild Bread. I had to stretch my budget but in the end I am so happy with my choice to begin my Mother and learn to make batter bread. The 8 cup measuring cup I have used several times in canning broth. It holds exactly what I need for 4 pint jars. It also came in handy for measuring chow-chow to can in pint jars. I haven't baked anything in the Pyrex baking dishes yet except for the batter bread but I know come next winter all kinds of good things will be cooked in them. Everything or most everything in my kitchen has to do double duty and my baking equipment is doing just that. Well worth the money I spent. I'm so glad to hear you've found dual purposes for your equipment! It's always scary taking the leap into a new endeavor and making an up-front investment, but we really spent time to seek out cost-effective equipment and used standard sized-items like the loaf pans and 8-cup Pyrex dishes wherever possible. Ashley I'm grateful to you and MaryJane for your care in picking out equipment. Y'all did a good job.